Happy Bump Day ladies, today I'm sharing my Bump Boxes goodies! If you follow my IG @Lollipop_Couture then you know my princess already made her appearance! This box felt like a welcome home baby box. Birds & Bees Teas, Easy Naps & Calm Nights: this tea retails at $3. If you are anything like me and can't seem to find the off button to your brain then this tea is a MUST it literally let's you catch up on your Zzz's! It is safe for you and your little one if you are breast feeding. The ingredient are all organic. This package is for four servings. The flavors are delicious, only down side it be great if it came in tea bags for easy steaming. This is a cute little plush rattle. It is small and soft for tiny hands to play with. Great news for you, mama: the plush toy quiets the sound of the rattle. So baby can play, and you can stay sane! If you love bedtime stories then you are in for a treat! This is a delightful bedtime story, Pajama Time will entertain your little one with a tale of jump roping chickens, pigs on swings, and elephants in fuzzy pajamas. My toddler enjoys books and it is never too early to read to baby! You can never have enough swaddle blankets mommas! This is a cute monkey print on 100% cotton muslin. This is a 44"x 44" perfect size for tummy time, stroller cover, nursing cover, burp cloth, or as a changing table cover. It is so soft and snuggly. Meet Ollie the Owl, he is a Bluetooth enabled portable speaker and white noise machine. It soothes your little one and helps them drift off to sleep. You can play their favorite lullaby by connecting to Bluetooth. It is also a voice recorder great for recording a message, lullabies, or stories. I love that it is portable I can clip it on stroller or car seat. The materials are chew-safe and soft incase the little one gets a hold of it. Best part it comes with a rechargeable battery for those 30, 60, 90 minutes timer or continues play mode. I will definitely get a great use of this nifty device, hooray for technology! I absolutely love this months Bump Boxes! It was a great welcome box for my baby and the items are hands down amazing! The total value of this box is $82.93 and the monthly subscription is $39.99 so definitely a great box. If you want to subscribe or give a gift to a New Mommy-to-Be I'll link my refferal link below. 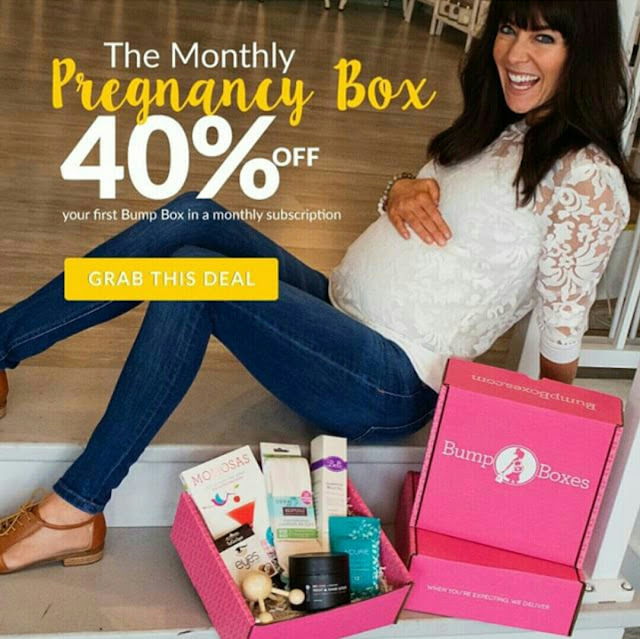 To save 40% off your first box use code BUMP40 at check out!